Creativity is a compulsion. A true actor acts not because of fame and fortune. They act because they have no other choice. There is no other life but to be the life of someone else; an act of insanity, nested inside a compulsion. We accept the art of acting because we accept the context: people can behave as strangely as they want provided it’s for the benefit of someone watching. So take away the viewer, and what does a true actor do? He or she keeps on acting, their creativity rolls on, and Leos Carax‘s Holy Motors lets us join the wild, hilarious, fascinating, and bizarre ride. Oscar (Dennis Lavant) rides in a limo with his chauffeur Céline (Edith Scob). The back of the limo is a dressing room where Oscar can prepare for his various “assignments” throughout the day. His assignments include playing a thug, an old woman, a deranged sewer-person, a motion-capture performer, and more. There are no cameras rolling, but Oscar is completely committed to his art, and the rest of the world appears to be in on the game. There is no boundary Oscar can’t cross, even between life and death, as long as he’s “in character”. Carax lets us know from the beginning that an actor will work without his audience. The movie throws us into the deep end with weird imagery and an unfamiliar setting, but the standout shot is an audience completely asleep. Audience members fall asleep in movies all the time, but if the whole audience was knocked out, would an actor stop his or her performance? Of course not. The show must go on, and it will go on whether anyone is watching or not. At one point, the true Oscar (who only shows himself in his limo) is talking with his producer (or someone who has the power to question Oscar; the man’s role isn’t made totally clear), and the man asks Oscar why he’s doing it. Oscar responds that the cameras have become so small, that the watcher has become invisible anyway. Has the context really changed so much from the technical reality? Part of the genius of Holy Motors is how it constantly asks us to reexamine the context of acting. When we look at the behind-the-scenes footage from the making of Avatar, or any recent blockbuster, we see actors covered in skin-tight suits covered in motion-capture dots. This doesn’t strike us as strange because it’s for the camera and the computers. But Carax takes Oscar’s motion-capture assignment, and slowly builds it from cool flips to firing a machine gun while running on a treadmill, and then goes crazy by having the actor grind against an actress who’s also in a motion capture suit and also surprisingly flexible. We can gawk at their behavior, but we’d never see it on the screen. Their acting has been consumed by digital artists. I would be remiss not to mention the brilliance of Lavant’s performances and how it dances beautifully with the various scenarios. It’s not simply a matter of quantity, and how he’s able to skillfully play so many roles. He’s not just an actor. He’s the representative for all artists. He represents their total commitment and fearlessness. His most important role is a standard bearer, and as that role, Lavant is a complete powerhouse. Lavant, as Oscar, draws us into the isolation and sadness of an actor without a part. The work may be exhausting and dangerous, but he is lost without it. He exists to create connections outside the limo, but his closest relationship is with his driver. Any other actor is simply a matter of two ships passing in the night. We accept it because we need the performance as much as the actor. They would keep performing without us, but Oscar receives assignments for a reason. We’re acting together because it fills a void. The performer can make us laugh, make us feel sorrow, and make us think. Carax and his cast are truly remarkable in how they can shift gears, and we can move into a completely different emotional state without missing a beat. We always know that Oscar is acting, but we’re totally sucked in as he plays an old man on his deathbed having a final conversation with his niece. Aren’t we as an audience the crazy ones for allowing ourselves to indulge what we know to be technically false? We pride ourselves on being rational creatures, but we see no problem with the irrationality of an artist’s craft because it speaks to an emotional truth. This extends to all art. We look at paint on a canvas, and it means something to us. We hear sounds played in a certain order, and we feel something we can’t explain. We see a man pretend to be someone he’s not, and we still make a connection. There is a method to the madness, and madness to the method. It’s also a shared madness because an audience is forced to question what we accept as sanity. Great art gives us a new perspective on the world, and illustrates an intangible. Great art forces us to look past what we’ve previously accepted as truth, and challenges our preconceived notions of the world. Great art is a celebration of the artist and the audience, and shows how the two intertwine into something ineffable yet truly sublime. 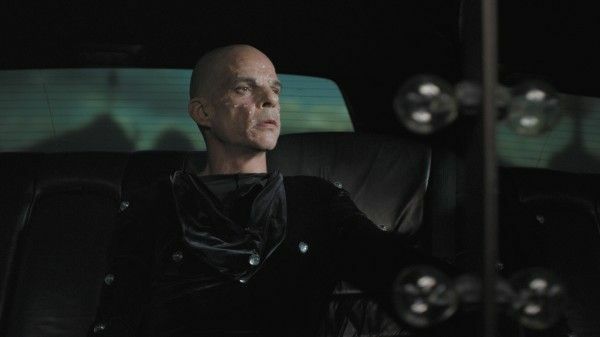 Holy Motors is great art.